For Honey Pineapple Chutney: Brush pineapple and onion slices with 1 1/2 tablespoons vegetable oil. 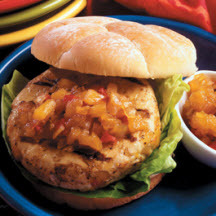 For Burgers: In a medium bowl, stir together the ground turkey, 1/2 cup honey pineapple chutney, jerk seasoning and 1/2 teaspoon pepper. Shape into 4 large flat patties and brush each with 1/2 teaspoon vegetable oil. Using the direct grill method, grill burgers over medium coals for 5 to 8 minutes per side or until cooked to an internal temperature of 165°F (73.8°C). Recipe and photograph courtesy of the National Honey Board.